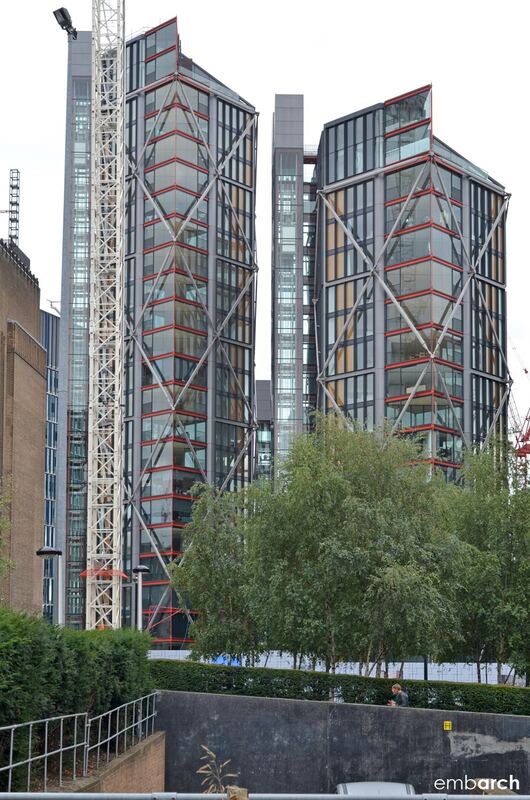 The famed Tate Modern museum sets the tone for this neighborhood, and architects for the residential complex of NEO Bankside responded by positioning six buildings in an orderly, gem-like arrangement along the edges of the site. Building massings are ‘cut’ to maximize the number of angled surfaces. The theme of angles appears throughout the site in repeating patterns, as if the entire composition were a product of crystalline fracture. The structures’ materials also contribute to the theme: reflectivity and hardness are provided by glass and steel; an external steel bracing system continues the pattern of angles.